Once part of arguably the most talented duo in the current NBA landscape, Kevin Durant and Russell Westbrook are now mired in basketball's most bitter breakup in recent memory. As if Durant joining the Golden State Warriors this offseason weren't shocking enough, the recent news of the way he informed Westbrook of the matter was rather astounding. Eight years together, five Northwest Division titles, four Western Conference Finals appearances, a Finals appearance in 2012—all of those were reduced to a single text message. With Westbrook recently agreeing to a contract extension with the Oklahoma City Thunder, expect "Beastbrook" to not only let loose (read: triple-doubles abound) but also play fired up whenever he's across Durant and the Dubs. But before we completely let go of this deadly 1-2 punch, let this quick mixtape of the best Westbrook-Durant connections be our parting gift. Usually, it was KD on the receiving end of the play, with Russ showing off one facet of his triple-double mastery: passing wizardry. 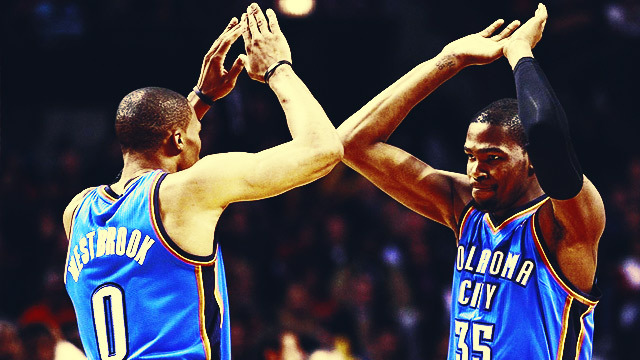 When it goes the other way around, a Durant-to-Westbrook alley-oop is such a wonderful display of finesse and ferocity. The two superstars weren't just in sync on the court. Russell and Kevin being on the same wavelength also translated to hilarious post-game press conferences. This super tandem will definitely be missed.